Own “Everything, Everything” on Blu-ray and DVD on August 15 or Own It Early on Digital on August 1! Burbank, CA, June 27– Make it a girls’ night in when “Everything, Everything” arrives onto Blu-ray Combo Pack, DVD and Digital. From Warner Bros. Pictures and Metro-Goldwyn-Mayer Pictures comes the romantic drama “Everything, Everything,” directed by Stella Meghie and based on the bestselling book of the same name by Nicola Yoon. The film stars Amandla Stenberg as Maddy and Nick Robinson as Olly, and also stars Ana de la Reguera and Anika Noni Rose. Meghie directed from a screenplay by J. Mills Goodloe. Leslie Morgenstein and Elysa Dutton produced under the Alloy Entertainment banner, with Victor Ho executive producing. “Everything, Everything” will be available on Blu-ray Combo Pack for $35.99 and DVD for $28.98. The Blu-ray Combo Pack features the theatrical version of the film in hi-definition on Blu-ray; and the DVD features the theatrical version in standard definition. The Blu-ray Combo Pack includes a digital version of the movie. Fans can also own “Everything, Everything” via purchase from digital retailers beginning August 1. What if you couldn’t touch anything in the outside world? Never breathe in the fresh air, feel the sun warm your face…or kiss the boy next door? 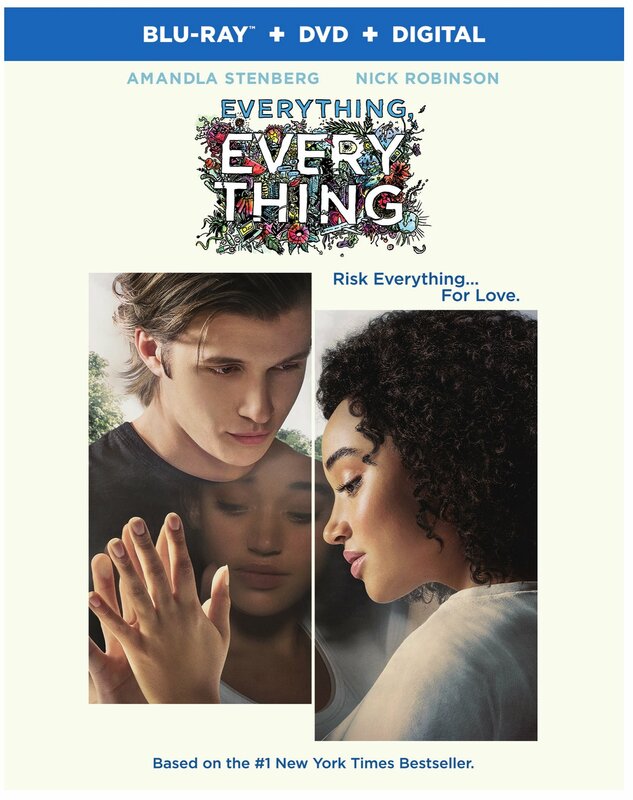 “Everything, Everything” tells the unlikely love story of Maddy, a smart, curious and imaginative 18-year-old who due to an illness cannot leave the protection of her home, and Olly, the cute boy next door who ignites her desire to escape safety and sacrifice everything for love. On August 1, “Everything, Everything” will be available to own for streaming and download to watch anywhere in high definition and standard definition on favorite devices from select digital retailers including Amazon, CinemaNow, FandangoNow, iTunes, PlayStation, Vudu, Xbox and others. On August 15, “Everything, Everything” will be made available digitally on Video On Demand services from cable and satellite providers, and on select gaming consoles.